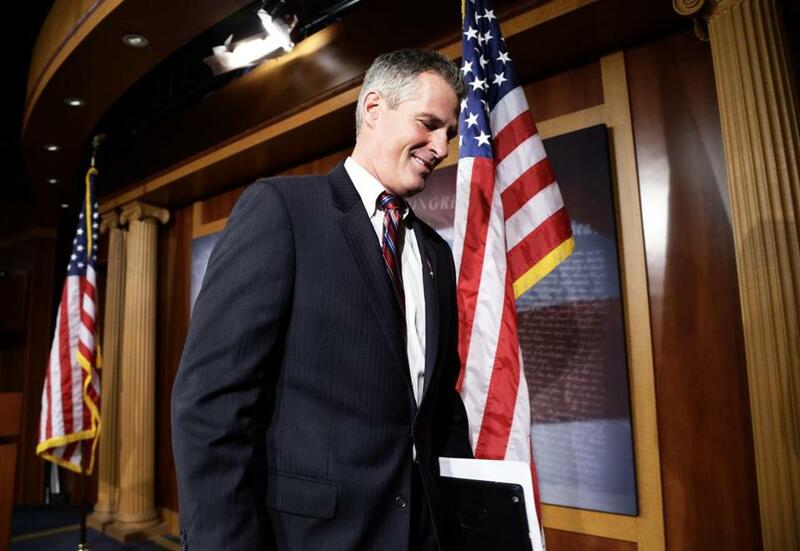 US Senator Scott Brown is angering some conservative activ­ists by trying to shape the new leadership of the Massachusetts Republican Party just weeks after losing a reelection campaign in which he tried to distance himself from the GOP. Brown, who is keeping ­options open for his political future, wants his campaign’s deputy finance director, Kirsten Hughes, elected chairwoman of the Republican State Committee next month. He sent state committee members a letter endorsing her Friday, two days after current chairman Robert A. Maginn Jr. bowed out of contention for ­another term. “Kirsten’s success and firsthand experience with local grass-roots building, raising campaign funds, and organizing and winning local campaigns gives her the skills that we need to make our candidates competitive up and down the ballot,” Brown wrote. A favorable chairman could help Brown if he were to soon run again for office and potentially give him more control over the money left in the party’s campaign account following last month’s election. Currently, there is more than $700,000 in the Massachusetts GOP’s federal account, GOP treasurer Brent Andersen told the Globe. Brown might have an immediate opportunity to run again for federal office if US Senator John F. Kerry leaves his office for a post in President Obama’s Cabinet. But the behind-the-scenes gamesmanship did not sit well with some Republican activists, who said their party infrastructure has long been used to benefit the prevailing politician rather than build grass roots. Brown campaign aides did not respond to multiple calls and e-mails seeking comment. Outgoing chairman Maginn ­also did not respond. Brown’s emergence as a player in the leadership of the state committee surprised some activists, who noted Brown’s emphasis on his bipartisanship and independence during his unsuccessful campaign. Andersen said he is disappointed about how the process is unfolding. “I was happy with the job that Bob Maginn was doing,” he said. Hughes, a professional singer and an attorney, is a former political field director for the Mass. GOP who ran the party’s state convention in 2010. She is also a Quincy city councilor. Hughes ended up being the first to declare, but her emergence did not discourage others. Rachel Kemp, a state committee member from Dorchester, announced her candidacy Thursday, as did ­David D’Arcangelo, a Malden city councilor, and Dean ­Cavaretta of Acton, who are running as a team. On Friday, Richard Green, 42, of Pepperell announced his candidacy. Green, who was elected to the state committee this year, runs an online auto parts business and is a founder of the Massachusetts Fiscal ­Alliance, which advocates conservative fiscal principles. “I want to bring folks together. I want to find common ground,” Green said of his ­interest in leading the state committee. His entry into the race could pave the way for a battle ­between Green’s conservative allies and Brown loyalists. Many Massachusetts Republican activists are deeply discouraged, having seen their hopes elevated by Brown’s 2010 special election and then dashed in two subsequent election cycles. But rare opportunities also lie ahead. If Kerry is tapped for a Cabinet spot, a special Senate election could be called for the second time in three years, and Brown would be the prohibitive Republican favorite. Brown could also take a shot at governor in 2014, when the party’s 2010 nominee, Charles D. ­Baker Jr., had been expected to make another run. Reached on Friday, Baker declined to comment on his intentions. Another wild card was dealt by former governor William F. Weld, who recently moved back to Massachusetts from New York and last week prompted political speculation by granting a series of interviews to the Boston Herald. Some expect Weld to run for the Senate seat, if it opens. He lost the same seat in an epic race against ­Kerry in 1996. It is unclear why the Republicans left so much money in their account at the end of such a competitive race. Massachusetts Republican Party spokesman Tim Buckley did not ­return calls to explain why the money went unspent. Andersen blamed the “people’s pledge” that Brown signed with Democrat Elizabeth Warren, discouraging political parties and other third-party groups from spending money on television, radio, or Internet advertising. “This is the first election ­cycle that we actually have some resources remaining where we’re not going to be paying off debts for the next several months,” he said.